Safety driver Jeff Runions with one of Starsky Robotics' autonomous testing trucks. 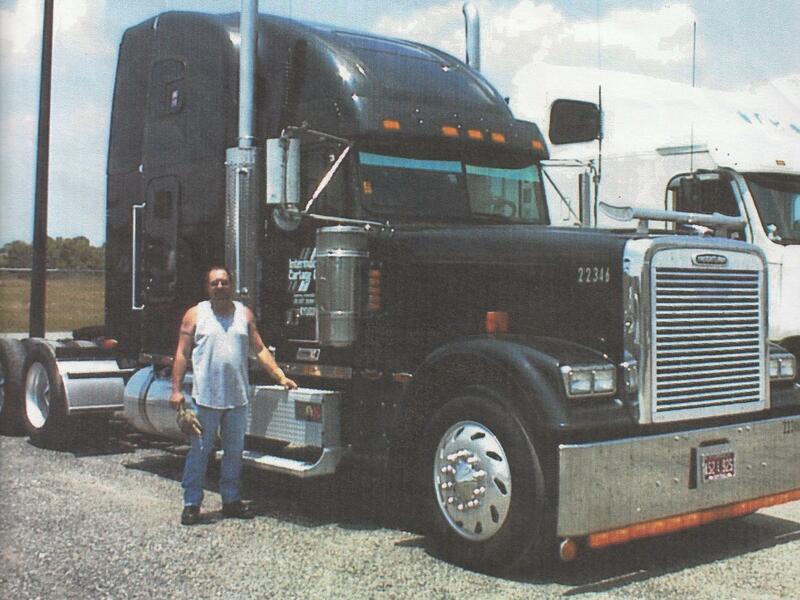 Jeff Runions, during his years as an owner-operator, with his truck. 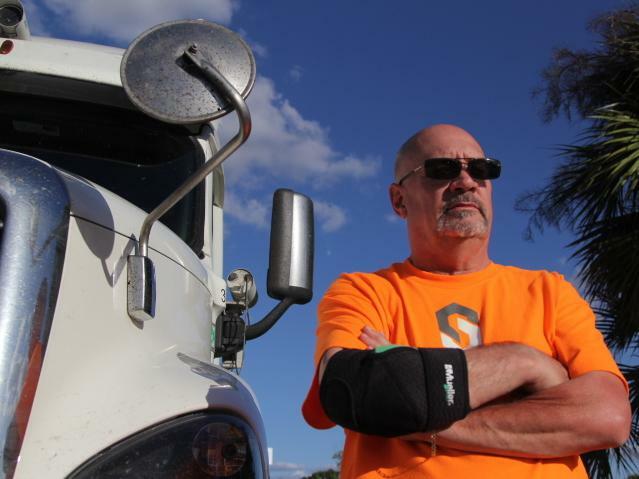 In his latest job developing autonomous trucks, Runions, 58, has a front row seat to what many see as the future of the 700 billion dollar trucking industry. He's found himself in the middle of a heated race between Silicon Valley juggernauts like Uber and Google to get their self-driving trucks out onto the road first. "It's like when they went to the moon," Runions says. "We're not going to the moon, but it feels kinda like a new technology's coming up and how many people would think a semi would be driving itself?" Runions, who lives in Jacksonville, Fla., works a startup called Starsky Robotics — a company smaller than Uber or Google. Instead of trying to beat their competition to developing fully autonomous vehicles, Starsky's strategy is to develop trucks that are fully autonomous on the highway — then let remote drivers take the wheel from offices filled with arcade-style consoles, when they hit city streets. The strategy is still in its testing phase: Runions is a safety-driver. He sits in the driver's seat of the truck cabin, ready to take control if there's trouble. His test rides range from an hour and a half to eight hours-long. He also works alongside his company's programmers to test and tweak the truck's sensors and software. "I come up with some suggestions once in a while and they do work. I'm not an engineer like these guys are, but sometimes they listen to me. So, that means I'm part of the team too," he said. Runions, after all, has nearly four decades of experience in the trucking industry under his belt. 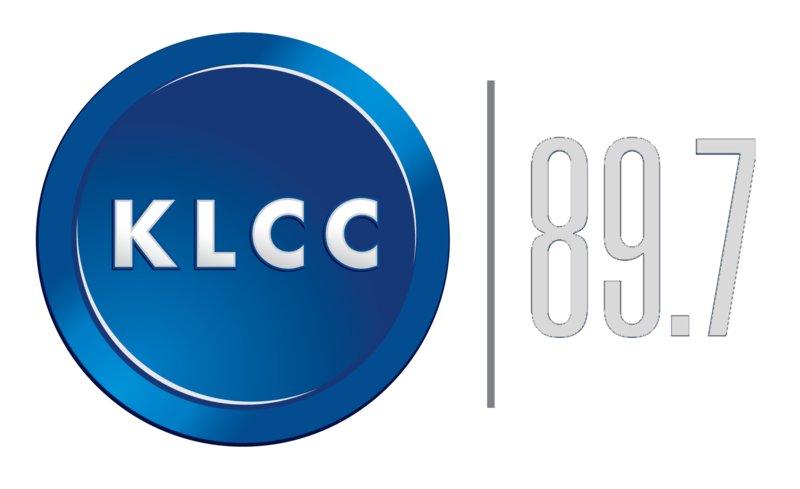 In the mid-80s, he became an owner-operator, and purchasing a truck and leasing out his services on contract to freight companies. For a while, Runions enjoyed the freedom that came with having his own truck and the camaraderie he found with fellow truckers he met while crisscrossing the country. "We were like the cowboys of the old days, doing our own thing," he said. "We were truckers, and we were young. We were having a good time." But as the years dragged on, life on the road began to lose its luster. Between regular sleep deprivation and a diet based on truck stop junk food, Runions started to feel that the trucker lifestyle was unhealthy. And the hectic schedule took a toll on his family life. "You just get tired of the same stuff all the time and sleeping in the truck," he said. You're in this little box all the time. You can't really go anywhere. The only thing you gotta do is go to sleep and get up and do it again." After fuel prices surged in the early 2000s, Runions decided that going it alone didn't make financial sense for him anymore. After more than 20 years of contracting himself out, Runions sold his truck and took a job with a commercial trucking company. But he soon found that the new gig had its own downsides. "A normal driver that works for a company, they gotta stay out three weeks at a time, and they give them two days off when they get home," he said. "Soon as they get home, after their two days, they gotta go right back out for 21 more days. That ain't much of a life. Then you're staying in that box again." Runions eventually worked his way up to management, but despite the position's better pay, he found its hours and stress were even worse. "I was always in there from 3 o' clock in the morning to 3 o' clock in the afternoon," he said. "I was [worn] out, so I decided to try something that was different. And you can't get more different than this." Runions came across an online ad for a technology company in search of experienced truck drivers. At first, he was unsure about getting behind the wheel of a self-driving truck, but he says he's come to enjoy the work and its hours. "I'm home when I need to be," he said. "I'm a happy person now." Runions says that since he began as a test-driver in early 2017, he's heard pushback from people who doubt the safety of autonomous vehicles. "People are scared of this technology because they don't understand exactly what's going on with it," he said. That's one of the reasons Runions finds his new job meaningful. "I feel like I'm helping make this truck right. And we want to make sure that it's safe as it can be being on the highway," he said. He's also heard from fellow truckers who fear that the new technology will put them out work. But Runions points out the of tens of thousands of open trucking jobs now that the industry is struggling to fill. He thinks that demand plus the growing need for remote drivers mean there'll be plenty of trucking jobs down the road. And, Runions says that allowing drivers to work remotely will ultimately make their lives better. "If you can get where you can [have] a 40-hour hourly [weekly] job like a regular person and be home for your family, can't ask no more than that," Runions said. "That's like a regular life. A lot of drivers don't have that." Now another installment in our series Brave New Workers, about people adapting to the changing economy. UNIDENTIFIED PERSON #1: I need a job, and I don't have a skill set other than flying. UNIDENTIFIED PERSON #2: One day, you might be cleaning the toilet. The next day, you might be doing some potentially Nobel Prize-winning science. UNIDENTIFIED PERSON #3: Maybe I don't just need a different teaching job. Maybe I need a different career. MARTIN: We begin today on a straight, flat stretch of paved road lined by lush forest just north of the Florida Everglades. MARTIN: That's where we met up with career truck driver Jeff Runions. JEFF RUNIONS: I've done everything from working on trailers, working on trucks, being an owner-operator, being a company driver, management. MARTIN: In his latest job, Runions has found himself in the middle of a fight for the future of the $700 billion trucking industry. Companies like Uber, Google, Daimler and Volvo are all racing to get their self-driving trucks out onto the road first. Runions works for a much smaller company, Starsky Robotics. RUNIONS: It's not the space race, but it's kind of a - you know, it's new technologies like when they went to the moon, right? And we're not going to the moon, but how many people would think a semi'd be driving itself? MARTIN: Instead of trying to beat their competition to developing fully autonomous vehicles, Starsky's strategy is to develop trucks that are autonomous only on the highway, and then let remote drivers in an office take the wheel when they hit city streets. It's all still in the testing phase. Runions is is a safety driver. He sits in the driver's seat of the cab, ready to take control if the truck gets into trouble. He also works alongside his company's programmers to test and tweak the truck's sensors and software. RUNIONS: I come up with some suggestions once in a while, and they do work. I'm not a engineer like these guys are, but sometimes they listen to me. So that means I'm part of the team, too. MARTIN: Runions got his start in the trucking industry nearly four decades ago. RUNIONS: I've been trucking since 1979. We were like the Cowboys in the old days, but we're doing our own thing. We own our own trucks and trying to make our own lives the way it is. MARTIN: He enjoyed the freedom that came with owning his own truck and the camaraderie he found with the fellow truckers he met crisscrossing the country. RUNIONS: We're truckers, and we're young, and we're having a good time. MARTIN: But he says that as the years dragged on, life on the road began to lose its luster. He says the lifestyle was unhealthy and the schedule became grueling. RUNIONS: You just get tired of the same stuff all the time and sleeping in the truck. You're in this little box all the time. OK, you can't really go anywhere. I mean, you - the only thing you've got to do is go to sleep and get up and do it again. MARTIN: And he says that after fuel prices surged in the early-2000s, going it alone didn't make financial sense anymore. So he sold his truck and took a job with a commercial trucking company, but quickly found out that wasn't much better. RUNIONS: A normal driver that works for a company - they've got to stay out three weeks at a time, and they give them two days off when they get home. As soon as they get home, after the two days, they've got to go right back out for 21 more days. That ain't much of a life. Then you're staying in that box again. MARTIN: Runions did eventually work his way up to management, but he says despite better pay, the hours and stress were even worse. RUNIONS: I was always in there at 3 o'clock in the morning till 3 o'clock in the afternoon. I was wore out. So I figured it's time to try something that was different, and you can get no more different than this. MARTIN: Runions came across an online ad for a technology company in search of experienced truck drivers. He says that at first, he wasn't sure about getting behind the wheel of a self-driving truck, but he says he's come to enjoy the work and the hours. RUNIONS: I'm home when I need to be. I'm a happy person now. I get to dress how I want to dress. I'm not using - I don't wear any uniform. MARTIN: Runions says that since he began as a test driver in 2017, he's heard pushback from people who doubt the safety of autonomous vehicles. RUNIONS: People are scared of this technology because they don't understand exactly what's going on with it. They think that the trucks are going to be out there with nobody in them, and they're going to be unsafe. I feel like I'm helping make this truck right, and we want to make sure it's safe as it can be being on the highway. MARTIN: He's also heard from some fellow truckers who fear that the new technology will put them out of a job, but he points out the country has tens of thousands of open trucking jobs that the industry can't even keep up with, and the growing need for remote drivers means there will be plenty of work down the road. Plus, he says, allowing drivers to work remotely will ultimately make their lives easier. RUNIONS: If you can get where you can make a 40-hour hourly job like a regular person and be home with your family, can't ask for more than that. That's like a regular life. A lot of drivers don't have that. MARTIN: That's career truck driver Jeff Runions He's now a test driver for Starsky Robotics, an autonomous trucking startup. He spoke to us for our series Brave New Workers on people adapting to a changing economy. Transcript provided by NPR, Copyright NPR.